Four hours later, I was definitely still drunk but it was surprisingly easy to get up and packing. My tent was quick to go down, the others followed suit. Everything was packed and we left the campsite by 8:15. So quickly in fact, that I didn’t even take a photo. I got the camera out on the journey back to Calais though. I didn’t envy Gail on the drive back. Low sun coupled with wet road – not good. It was about 11:30pm when we got to the same motel as 2 weeks earlier. This time I was sharing a 3 person room with 6 other people. The floor was not comfortable. After a couple more hours of sleep, we got back on the road and onto the ferry. The journey was wobbly, but no one felt sick (that I noticed), I was enjoying trying to stand on one leg on the deck. Once we were driving on the left again, Rachel, Kelvin and Josh were dropped off along the way. We arrived in Bath in the early afternoon, unpacked the things, had showers and ate pies at the Raven in the evening. WOOP THE END HOORAY. I went on this trip to try something new. Having not done any white water at all, I wasn’t expecting to be great at it. It’s true, I wasn’t. Even with the most stable boat there I fell in too many times. But hey, I had a lot of fun. Thanks to the leaders for rescuing me! 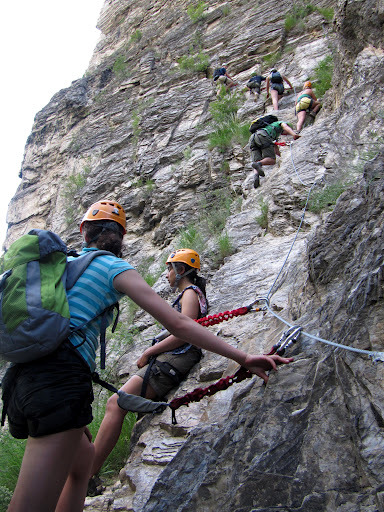 I actually tried 2 new things that trip – Via Ferrata was completely new as well. I think I enjoyed that day more than the actual kayaking, mainly because I wasn’t upside down nearly drowning on occasions. The rest of the time when I was the right way up in the boat was great though! It was worth going just for the sunshine, and I have some interesting tan lines to prove it. What a fantastic 2 weeks that was! Another early start, we were woken up at 8 and left at 8:30. Back to kayaking again (for a change), today was Guil day. I have finally lost the dunce shirt! Hannah had forgotten her helmet. Most people (except Will, Kelvin and Izi) left from the start (the Upper-upper Guil). The river was really low and had several rocks about. Although I scraped a few I didn’t go in. Right at the end of the upper-upper there was a weir, which we all had to get off for. I hit a further rock at the start of the eddy which almost tipped me over, but a late executed low brace saved me. The dunce shirt changed hands again, for Rachel had left the bung out of her boat (apparently not her fault). Priyanka, Emily and I were to paddle no further, but the rest carried on with the more complex upper Guil. After that a few experienced ones successfully paddled some of the more complex parts of the river (Château Queras and the Triple Step). Dinner this evening was my group conducting a barbecue. 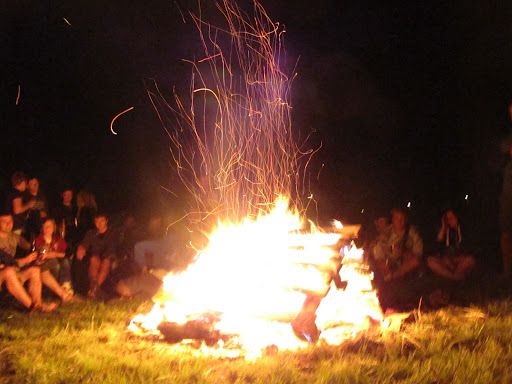 Like the last barbecue, this was followed by a bonfire. Southampton, Birmingham and Aberystwyth joined us to make extra conversation. Delayed start to this morning in order to let people clear their hangovers, or faff. The original plan was to paddle the Onde, then the Gyr, then the Gyronde. 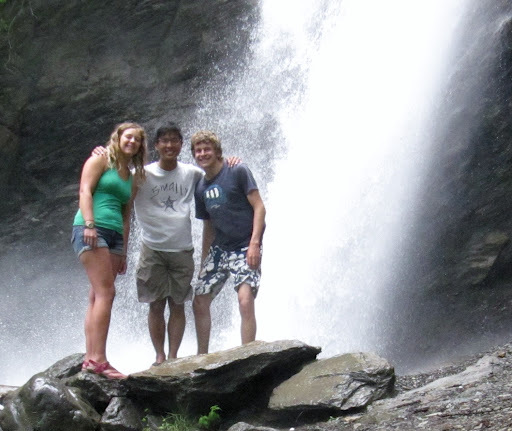 Kelvin, Emily and I went on an adventure and found a waterfall instead of paddling. Most people paddled the Onde, but there was a fair amount of carnage due to low levels which put many people off the original plan. We returned to the campsite and rethought the plan over lunch. The new plan was to go to Briançon and either go on the river or chillax in the spa. The thought of warm water for a change appealed to me, but a fair few just stayed at the campsite for the afternoon. The 4,70€ fee was worth it, just for the hot shower. Somehow I managed to do something to my shoulder while swimming, I don’t know how! We went shopping for supplies in the afternoon. After that Ralex, Hannah, Alice and I definitely didn’t go and get pizza and eat it at the Fournel without anyone else knowing. The evening saw most of us getting very drunk. 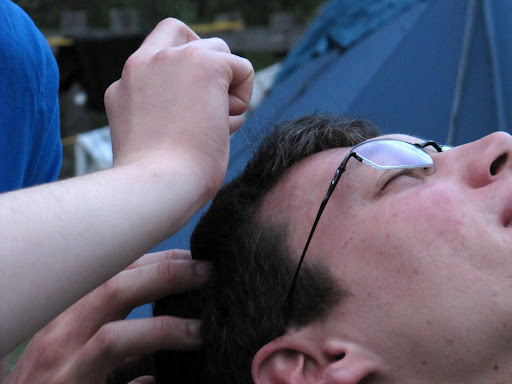 Various students were given awards – Will got ‘Most entertaining drunk’. 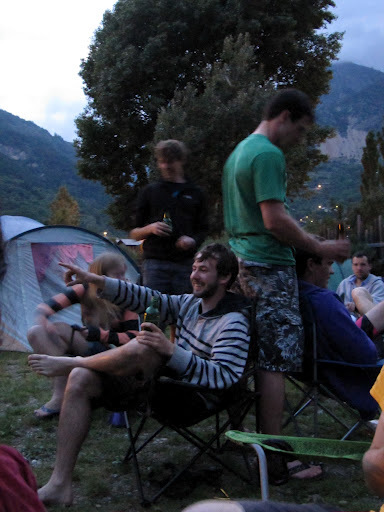 We socialised with the other unis that were staying at the campsite, which was good fun. One of the guys, possibly from Birmingham, decided in his drunken state that it would be a good idea to swim down the slalom course on his own in the dark; an idea which would have been dunceworthy, let alone deadly. Me and a couple others from Birmingham helped him get away from the edge of the water. It was by far the hottest day of the trip so far, and we didn’t have any rivers planned. A few went to the Durance gorge, but most stayed at the campsite and either paddled on the lake or just sunbathed. I’ve developed a pretty nice dunce shirt tan. Needless to say, there are no photos of those tan lines – I hope. Lars ran the slalom in a paddling pool… as you do. Later on in the afternoon was the BoaterX competition. 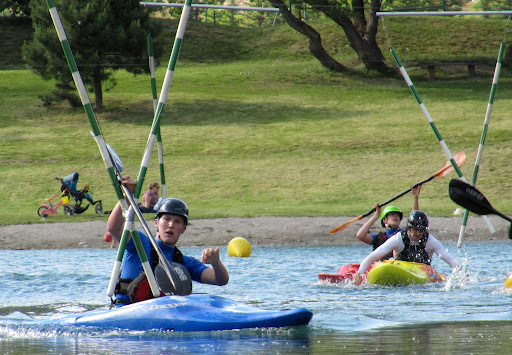 All entrants go down the slalom at the same time and the first person to reach the end wins a set of paddles. The entrants from Bath destroyed the competition, winning the Beginner (Joe) and Intermediate (George) competitions, and 2nd place in the Expert (Luke) competition. There was a race across the lake in inflatables as well, which we didn’t win, but they enjoyed it. 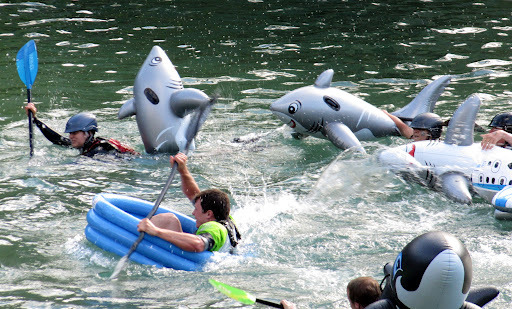 The inflatable race was definitely entertaining to watch. The evening saw a party on the island, which from the stories I heard I’m glad I didn’t go to, since I was definitely not drunk enough. Somehow I still have the dunce shirt. 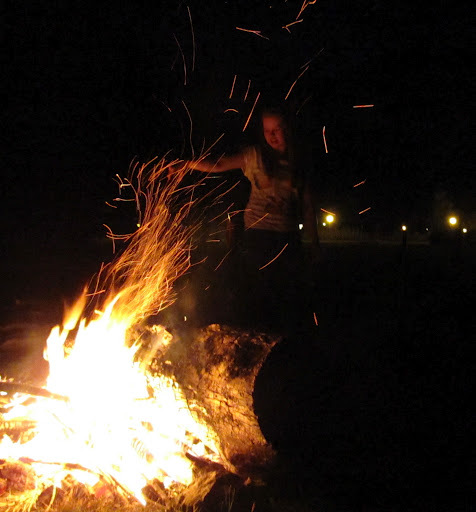 It (and consequently I) smells like last night’s bonfire. Many silly things happened today: Hannah broke her chair; Josh pissed on the beers; and I dropped my beer (but that’s fine since I’m already wearing the shirt). Anyway tomorrow I will have passed it on. Today was a day of complete non-water-ness. A few people did complex runs on the water, but the majority did other things. Many, including myself, did Via Ferrata. I had no idea what it was; it’s similar to Go Ape, only more challenging, with cliff edges, and higher up. There were 3 courses, all of which involved climbing across cliff faces. We had limited harnesses, so I didn’t do the second run so that others could. I’m glad I did the last one though – for 3 hours we climbed up cliff faces, walked across bridges, climbed across cliff faces, enjoyed the view etc. It was probably the most fun day of the trip so far simply because I felt so comfortable doing it. I never felt scared or unsafe, even while holding on to the cliff face 350ft above the ground. That last run in particular made for an absolutely fantastic view! Don’t look down – not for those afraid of heights! 120m higher than when we started off – and we still had to get back down! Chill out day today! Some people went on a river, but the majority wanted to take a day off to visit Briançon. 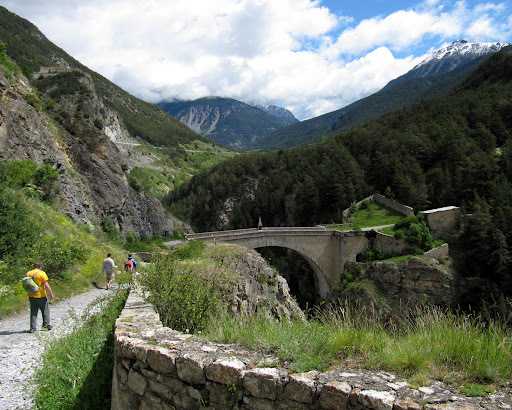 We went to the bridge overlooking Briançon gorge, which the experienced ones had paddled on Sunday. Afterwards we found a café and had the nicest of coffees. My group cooked chilli con carne in the evening. Ethan’s face told us that his vegetarian dish had too much chilli. I should have taken a photo, it would have been hilarious. This river, the lower Claree, was not good. The levels were low so there were plenty of rocky obstacles everywhere. Jon took a roll right in front of me, claiming it was to clean the dunce shirt. I swam twice: the first time was into a tree on a corner, much like my first swim; the other was by hitting a rock which plunged me into the freezing water where another rock decided to punch me in the face. It was too shallow to roll so I had to take a second swim while receiving a couple of cuts and bruises. Once again I lost my bottle to the water. The river had a few obstacles where we had to get out and walk past. On the plus side, there was fantastic scenery. It’s a shame I couldn’t bring my camera on the boat with me. The evening was cold but clear. 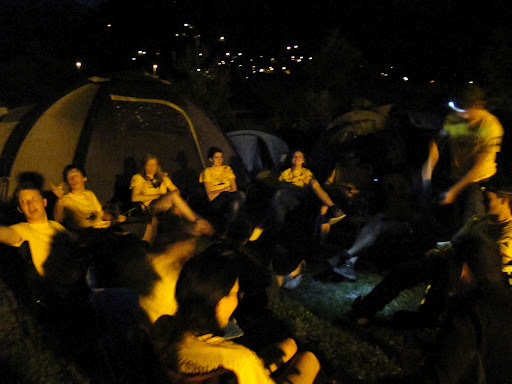 My group did the washing up while everyone else played night volleyball and went stargazing. 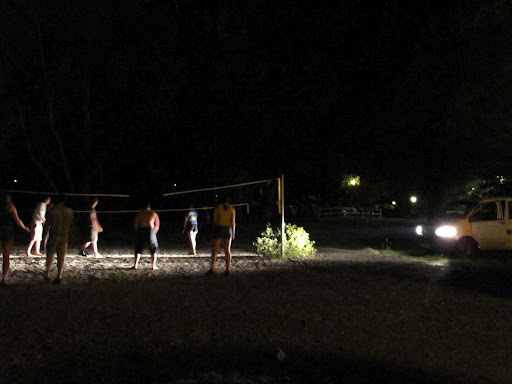 Night volleyball, with help from the vehicle’s headlights. 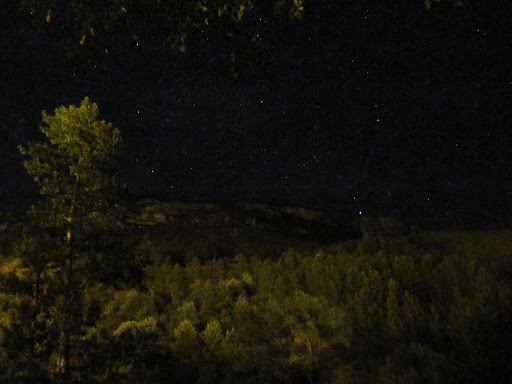 I decided to try and take photos of the stars but the results weren’t very good. I need a better camera, like Tom Lowe‘s. Today was an incredibly early start – we were up and out of the campsite by 8am. 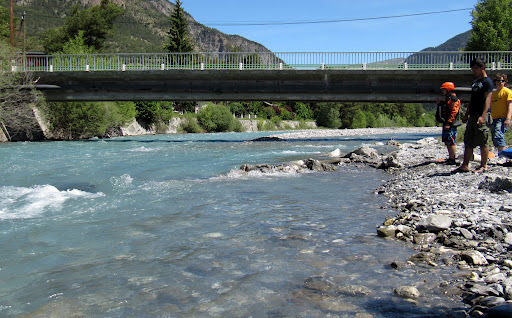 We drove to the Ubaye river, some 45 minutes away. Kelvin, Ethan, Will and I decided to have the day off, so instead of kayaking we went to the get-out and made an eddy so the paddlers could get out easily. While most appreciated our hard work, George just ploughed through the wall. A damn fine eddy, even if I say so myself. Nice and easy run in the morning, not much to say. 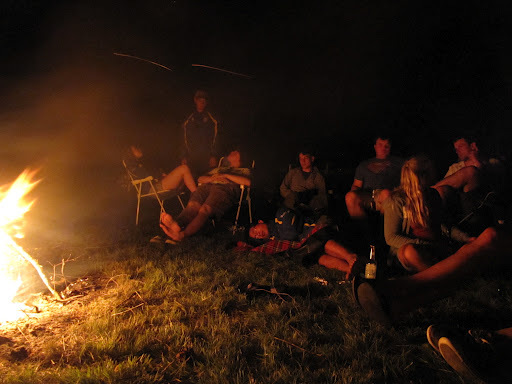 When we got back, the general consensus was to paddle from higher up the Durance and end up at the campsite. Because levels were low I decided to walk from the campsite to l’Argentiere and buy snacks from Carrefour. Ben Howard was playing on the shop radio. When I returned, everyone else had arrived and were gathered at the start of the slalom. I wanted to join in so I got my kit ready and headed to the start. By the time I got there some of the groups had already started and were hopping between eddies. A group of leaders were near the start so I shouted to them saying that I wanted to come down. I thought they signalled that it was OK, turns out it wasn’t a signal at all. I went down and they were surprised, I fell in, swam, got rescued and was awarded the dunce shirt. We had beers and a barbecue in the evening on the island in the lake. After the food we lit a fire and stayed until the early hours of the morning. Don’t worry, we’ll clean it up tomorrow. Part 2: the bit where I actually do some kayaking. This was our campsite, the Durance runs right past it, so the site is always full of kayakers. There’s also a slalom course and a flat water lake, for leisurely happenings. After waking up, the campsite staff told us that we were on the wrong pitch. We had to move our tents with some stuff still inside, right down to the other side of the campsite. We gathered kit, were assigned boats, put into groups of 4 (2 leaders and 2 novices), given a pep-talk, then we got onto the river by the campsite. This was my first experience of white water in a kayak, and all of the moving water was pretty terrifying to say the least. After pushing through the first few sets of waves, I approached a ‘hole’ (a large dip in the water with a nice big wave attached to it). I went into it partially sideways and it flipped me over. The water was cold but I acted fast – I rolled back up first time, casually. Further down the river was a sharp bend. I hadn’t perceived the current properly and I was pushed to the edge where a tree high-fived me. It pushed me into the water. I tried rolling again but there were branches holding on to my paddles. With no further means of escape, I popped my deck and swam to the nearest eddy, while Luke and Gail rescued my boat. The cold got to me quickly and the shock prevented me from breathing easily. My paddles weren’t recovered – they’ll be somewhere in a lake now. Luckily, Luke had a spare set of collapsible paddles which I used for the remainder of the journey. In the evening, we pulled out some of Lars’ grey hairs and Alice’s group entertained us with a game of Mr and Mrs. Turns out I know absolutely nothing about everyone in the group. Grey hairs were starting to show, even though he’d coloured his hair just before leaving. Some people had devised a plan to cheat at the game. I wasn’t clever enough to do such a thing. We went for 2 sessions today. We took the lower Guil which flowed into yesterday’s one. We did the slalom again and got out for lunch. We then carried on from where we left off and I’ve realised I’ve started the last four sentences with ‘We’, I’ll continue. We then stopped off at the side of a small cliff (only like 3 metres), got out of our boats and climbed up. The challenge was to slide down this cliff into the water in our kayaks. I initially didn’t want to do it, but a small amount of peer pressure made me go for it. I slid in, flew gracefully through the air and landed in the water, without rolling over! Further down the river it got a little choppier, I handled it with ease. We then got off at a large eddy and pulled the boats onto the side. Walking down the river a little, we saw what was to come. A massive wave which had a special name, which I can’t remember. We only had to attempt to traverse it if we wanted to. I didn’t. Others did; some stayed up, the rest swam. 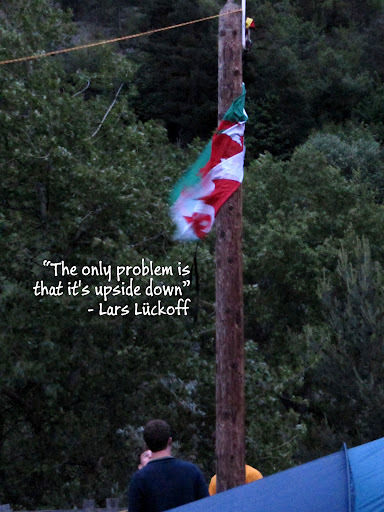 The evening saw Lars trying to hoist the Welsh flag onto a pole using a throw line, with limited success. Wales because it’s the only flag we had. My team had to invent the evening entertainment. 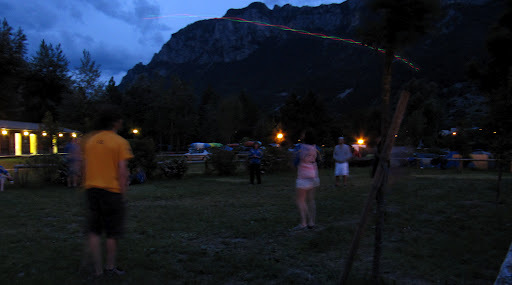 I had brought along a light-up frisbee and we used it for a twilight ultimate frisbee tournament. It went pretty well – people didn’t quite understand the no contact rule, but that didn’t spoil the fun. Frisbee flying gracefully through the air. 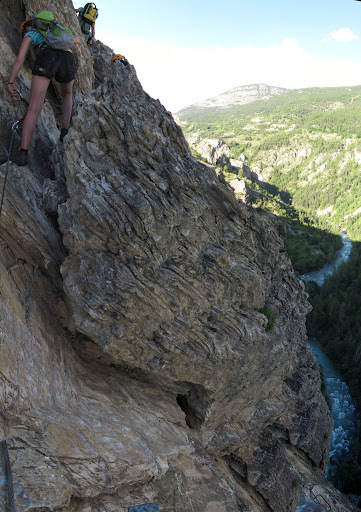 The first river we went to was the Briançon gorge, which only the experienced people did. Josh fell in and injured his thumb and had to go to the hospital. The rest of us met the survivors further down the river (on the Pyrelles), and had a fairly leisurely paddle for about half an hour before getting off and having lunch. In all my life, I cannot believe I’ve not given Camembert a chance – it is fantastic in a ham, salami and salad baguette! The experienced paddlers did the Gyrond while the rest of us were shuttled back to the campsite. It was raining in the afternoon. I sat in the group tent with many people and just chilled. Josh had returned with just a swollen thumb, no breakages. Being a Sunday before a bank holiday, all the shops were closed, so there was no way for the group to buy food for dinner. So the group split, half for pizza and the other half went to McDonald’s. I learnt a very important thing – Royal Deluxes are horrible, however French McFlurries are really good! It wasn’t my fault, but we left Iwan in McDonald’s. Luckily he managed to hitchhike back, but he wasn’t very happy! We were told that the upper Guisane was similar to what we’d done previously, but with a few more rocks. Personally I disagreed, since the water was quite low and there were many rocks and tree-related obstacles around. I was kayaking in a group with Priyanka, Gail, Stu and Ralex, so there were plenty of experienced people to help out when Priyanka and I fell in. I hit a rock on two separate occasions, and both times I attempted to roll, but the water was too shallow so I had to swim. I lost my bottle the first time I went in. The water was cold, but I wasn’t in as much shock as the first time I swam three days ago. I was pretty cheery both times, despite how much I was shivering and how little I could feel at my extremities. After finishing the run, most people climbed out but the more experienced carried on further down the river. When we returned, it was baking hot, so we chilled outside with Ice Tea and sweets for several hours. England and France were playing football, so Ralex, Iwan and I went to the hut down the path to watch the game. 1-1, but France seemed to be playing a much better game. After returning from the hut, the rest of the group had been drinking for the past hour, so I had to catch up. Dinner was good, but Kelvin was very drunk. He went into the tent to “sober up” and ended up falling asleep soon after. Thankfully we weren’t going to be kayaking the next day. With the state some people will be in in the morning I thought that was for the best. 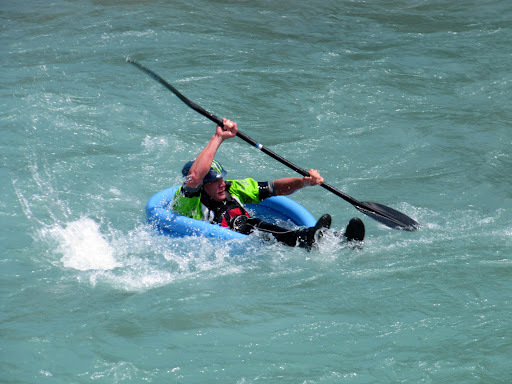 I went white water kayaking in the French Alps with the canoe club. Seeing as I’d never paddled any white water before (at all), I wasn’t sure exactly how much time I’d spend kayaking and how much time I’d spend sitting around waiting for the others to finish kayaking on rivers too difficult for me, but I went all the same. This is what happened. I hadn’t seen 7:30am in a very long time, but that’s when I got up. I’d packed the night before, but I was well aware that I needed to pack a few more things in the morning, like my toothbrush. 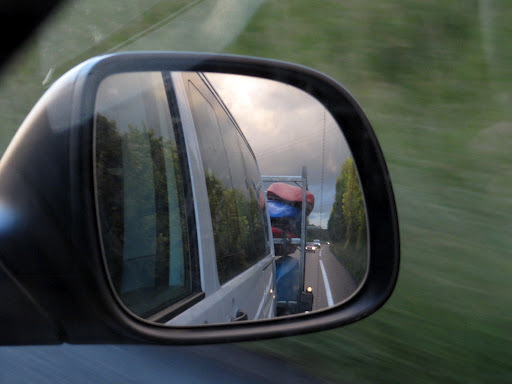 After a fair amount of faffing, including washing up and making my room look tidy (to a student’s standard), I left the house at 9:30 to meet some of the other kayakers at Gail’s house just down the road. 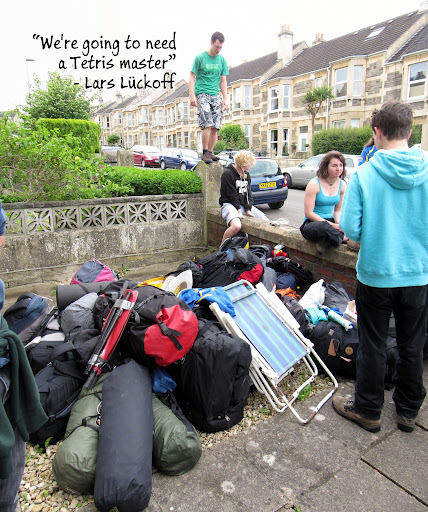 Once everyone had arrived, we put our bags in the front garden, which quickly became full. The vehicle arrived with a trailer. 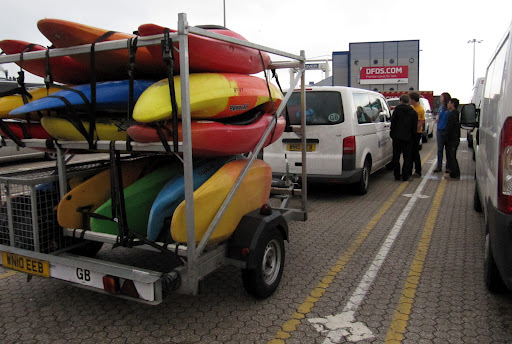 Once everything was loaded, we drove to the boathouse to meet the others and load the boats and kit. Whenever I mention the ‘vehicle’, it is a 9-seater minibus hired from the student’s union. We had 2 of them for the trip and a couple of graduates’ cars so everyone could fit. Once everything was packed properly, we walked over to a Chinese restaurant to get lunch. Importantly, this was the time we were given our trip t-shirts. Everyone was paired up and given a nickname. These nicknames were mostly children’s characters such as Bill and Ben, Mr Happy and Mr Grumpy, Pebbles and Bambam etc. I was Tom and Kelvin was Jerry. The pairs were drinking partners, meaning they had to match each other drink for drink, including penalties. After the food, we walked back to the boathouse and hit the road for Dover. Everyone had to bring a CD for the journey to keep us entertained. The challenge was not to have the same tracks as anyone else, with the penalty of consuming a couple of digits of alcoholic beverage per matching track. There were a fair few clashes, but none of mine matched anyone else’s! The penalties which we were threatened with weren’t enforced in the end. We got to Dover early and had to wait 2 hours for our ferry. When it was time to move, one of the vehicles’ battery had run dry. We tried push starting it (Izi ‘helped’ by pushing the trailer with us), but to no avail. Luckily the P&O staff came quickly with the jump leads. Josh tried reattaching the trailer but as we pulled away we discovered the trailer was attached only by the breakaway chain. Josh was hence awarded the dunce top. 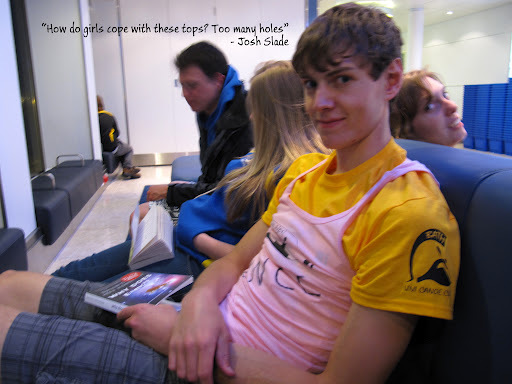 The dunce top is a pink girls’ tank top with DUNCE and IDIOT (for the French) written in marker. It is passed on to the next person who does something stupid. It looks really silly. On the ferry, Luke gave Lars a massage. Out of the ferry now (00:15 French time), we eventually reached the F1 motel, where there were 2 rooms to share between the whole group. Each room had space for 3 people on the beds and 4 more on the floor. The remaining students (myself included) decided to sleep in the vehicles. After less than 4 hours asleep, I learned that I had definitely made the right choice to sleep in the vehicle. Joe described the motel room as an “orchestra of snores”, with Jon apparently being the loudest. We stopped at a service station for a heavily overpriced breakfast. Several service stations later, I needed sleep badly and my hayfever was taking effect. Lying on the concrete, I asked Jon how much longer we had to travel, to which the answer was “about 4 hours”. The noise that came out of my mouth was comparable to Homer Simpson when Marge is out of pork chops. 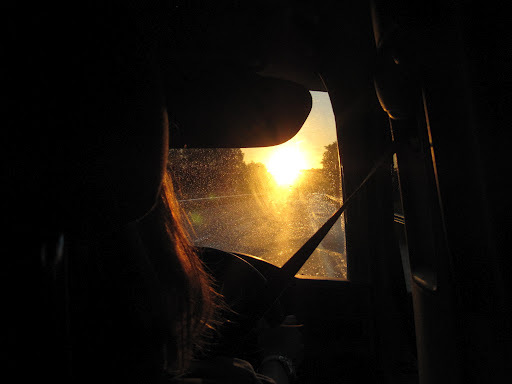 That day saw us being on the road for 14 hours in total, but we eventually arrived at the campsite. It was just getting dark, so we put up the tents right away and pizza was ordered for the group for dinner. We went to bed pretty soon after eating.